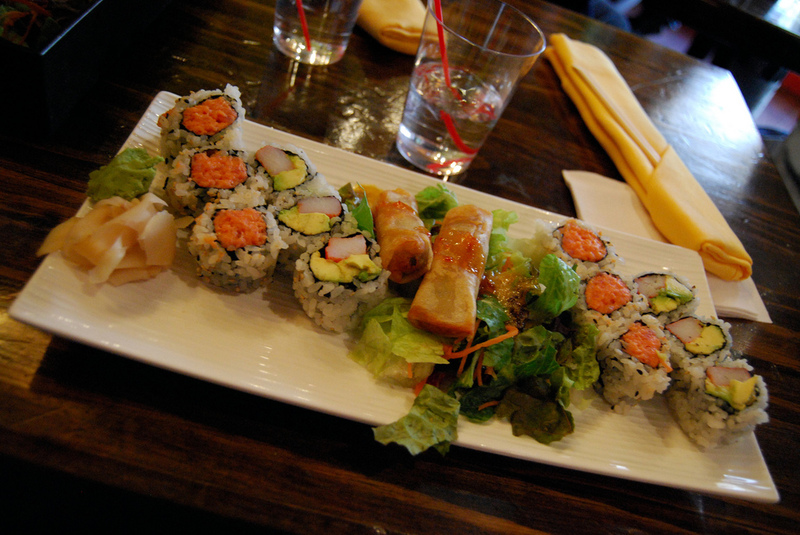 The location for the event was Amber, a highly rated sushi restaurant, and the upstairs area had been completely commandeered by Reni and company. When you first come in you’re welcomed by the maids in well-meaning Japanese, given a name-tag and assigned your maid for the day. As par for the course you are referred to as either “Master” or “Princess” for the rest of your stay by your maid, which adds to the authenticity of the maid cafe experience. There is an nominal entry fee of $12 dollars to enter the cafe, less if you’re in cosplay, which considering the experience is a real bargain. 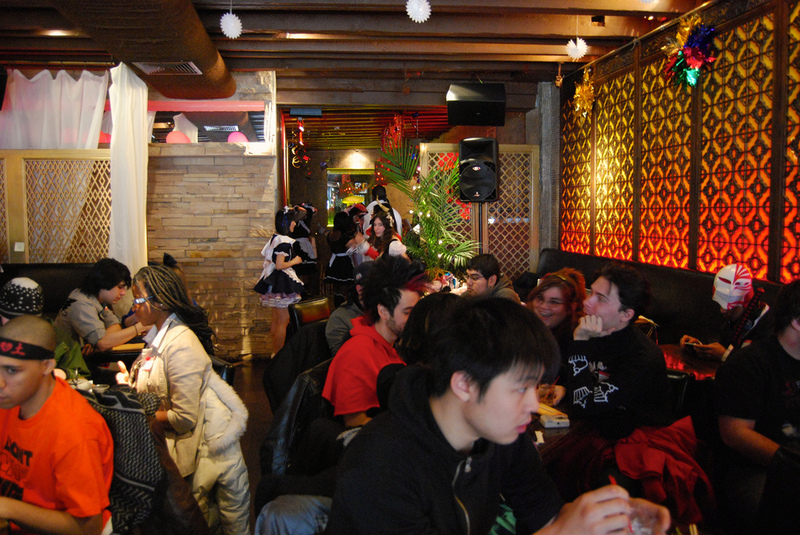 Once seated you’re presented with a menu, and you begin to take in the atmosphere; anime theme songs play over the intercom and maids shuffle and scurry about checking on their respective tables looking as cute as humanly possible. The items on the menu have been renamed to sound cuter but they are still the great dishes you would expect eating at a restaurant like Amber. I found my Moé-sushi bento box to be on par with most higher end sushi places in Philadelphia and prices are very reasonable to boot. I felt the maids to be very responsive as both waitresses and hostess making time to pose for pictures as well as get you your food in a timely fashion as well. Once the food came out the experience kicked into high gear, with each table having to compete with their maid in a “maid challenge” for a “special prize”. While the prize in question was a Reni magnet, I think the interaction with the maids was a welcome distraction while you waited for food or while you were passing the time before Reni’s performance. Once the time came for the performance, there was definitely more audience participation in store for the patrons of the cafe, which filled the upstairs to capacity and I even overheard they were looking to the possibly take over the whole restaurant next time. Reni started out the show with about 5 maids doing dance numbers, then she took different opportunities to call the audience up on stage for various ice breaking exercises such as a cosplay fashion show and a call for birthdays. The crowd was slowly turning from a room full of strangers to a group sharing an experience and getting to know their fellow patrons. By the end of the show the cafe had turned from a group of people sitting around tables to a group of friends having a full on anime dance party. It was really great seeing people progress through the afternoon, as they got to know one another and became quick friends thanks to their common interests in both maids and Moé (cute) culture. At the end of the day there was plenty of time for pictures with your favorite maids. You could tell the maids really enjoyed the experience just as much as their patrons as they posed and the onlookers snapped away. This experience is truly a testament to our host, Reni Mimura, who is able to take some of the most anti-social fans in fandom, and give them an experience they will not soon forget, bringing them together with both music and Moé. 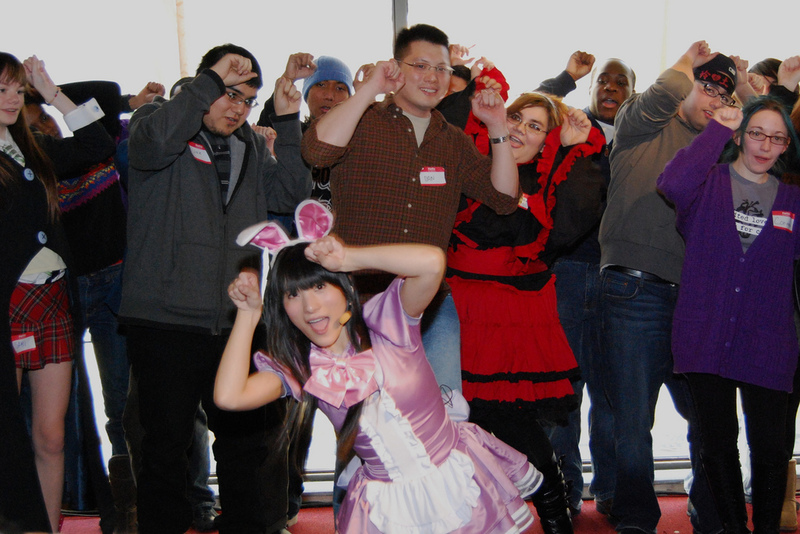 I had a blast and you can tell everyone in the room did as well, as people were not quick to leave at the end and already making plans to attend the next maid cafe in another month. But if you’re planning on attending next month’s show, show up early to make sure you get a table and bring some cash to tip your maid afterwards! You can check out my full Flickr set of the event here.